Team up with legendary superheroes as they battle evil, avenge dastardly deeds and spread dessert throughout the universe. 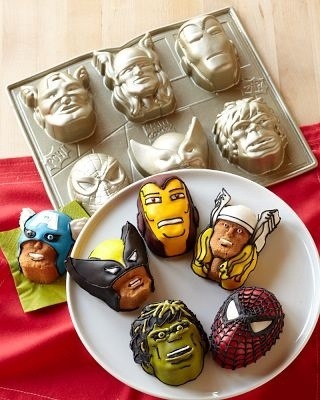 The action begins in the kitchen, where our cakelet pan brings six favorite Marvel comic-book characters to life. Turns out individual Captain America, Thor, Iron Man, Spider-Man, Wolverine and The Incredible Hulk cakelets. Durable cast aluminum distributes heat evenly and will not corrode or rust. Premium nonstick finish releases cakes in a flash, so each character emerges with precise detail intact. After baking, use colorful icings and sprinkles to give your heroes their superpowers—and let the action begin!